It's every school supply lover's favorite season! Time to get your paper and pencils on point, because it's back-to-school time. This project is perfect for prepping your pencils to take some serious notes with serious style. 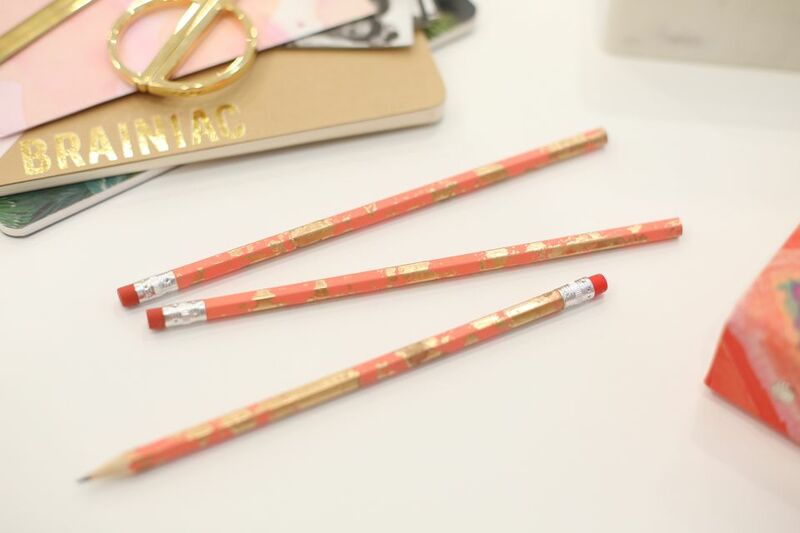 The punch of color combined with the gold marbled effect makes for a pretty combination and some one-of-a-kind writing gear. Make some for yourself and a whole bunch for your friends, because chances are people will want to borrow these babies. Start with a bowl of clean, room temperature water. Temperature is important for this project; if it's too hot or too cold, the liquid gilding won't float on the surface of the water, which makes it difficult to get the marbled effect. Use masking tape to cover the eraser and the metal band below it. Be sure the tape is fully sealed to keep out all paint. In a well-ventilated area, spray the unmasked portion of the pencils. Use thin, even coats. It may take 2-3 coats before you achieve your desired coverage. Allow the paint to fully dry and cure. Drip a few drops of liquid gilding onto the surface of the water. Drop them gently, from just an inch or so above the surface so that they don't sink to the bottom. The more gold you drop on the surface, the more will cover your pencils. If you plan on making a few pencils at a time, add a few extra drops so that you can dip them in succession. Once you have your desired number of drops of liquid gilding floating on the surface, use the end of a paintbrush to swirl them around into a marbled pattern. The gold will start to break up and flake across the surface of the water. Holding onto the masked portion of the pencils, dip the painted portion into the water, just until the gold starts to cling to the pencil. Roll the pencils so that all areas are covered with the marbled pattern. Dip them one at a time. You can keep dipping new pencils as long as you still have enough gold on the surface of the water to adhere to the pencils. Clip the masked portion of the pencils into clothespins so that they stand on end. Allow them to dry fully. If necessary, use a tissue to help remove some excess water from the surface. If a drop of water is stuck under some of the gold marbling, carefully press it out and soak it up with the tissue. Carefully remove the masking tape from around the eraser and metal at the top of you pencils. Now sharpen them up, and get to school!